”Sometimes people have a thick layer of defenses but it is possible to connect with the wounded person inside. It does require patience and ability to ignore misguided anger.” While this is sensible and logical advice I find it more than a bit ironic. In my own experiences as a Graduate Student studying Art Therapy our professors advised us that clients with such personality traits made for difficult clients and we may wish to avoid taking on such clients unless we specifically were trained to work with them. Dr. Abbott’s advice on the topic seems to make much more sense and also highlights her skills at helping others. The Author speaks rather frankly on the duality of the roles in her life as both mental health professional and mental health consumer. Not only is she a counselor, a healer, a therapist but also a client herself. This gives her a unique vantage point. Later in her book she sums up a personal account of her own depression. She tries to explain the distorted thought processes someone who is depressed goes through. 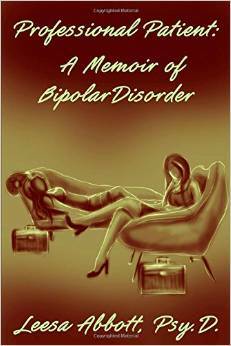 Most of her memoir she struggles to find balance between Mental Health professional and Mental Health Client. Sadly, there is such a stigma left in our society especially in America and much of that is rampant among mental health professionals. During the second half of her book the Author constantly discusses this push and pull between wellness and becoming unwell. There is a conflict between being a caring compassionate professional in this field and the shameful isolation in being a unique person with their own diagnosis. One of my favorite parts comes near the end of the book. It is here we see her as a caterpillar finally shattering the cocoon of stereotypes and growing her wings. Back on page 77 she gives the reader a quote from Mother Theresa, but I see many ways on how this quote is echoed throughout the Memoir itself. “Do not think that love, in order to be genuine, has to be extraordinary. What we need is love without getting tired.”(p.77) The Author in many ways embraces her own self through love, self-love and love for others as well. She accepts she is a butterfly. She accepts that she is also a coin with two faces. Her inner conflict seems elegantly resolved as she reflects that. “One day I had an epiphany.” This leads to much description of the need to develop her own self-worth for herself. She details this development of self-worth along her journey.